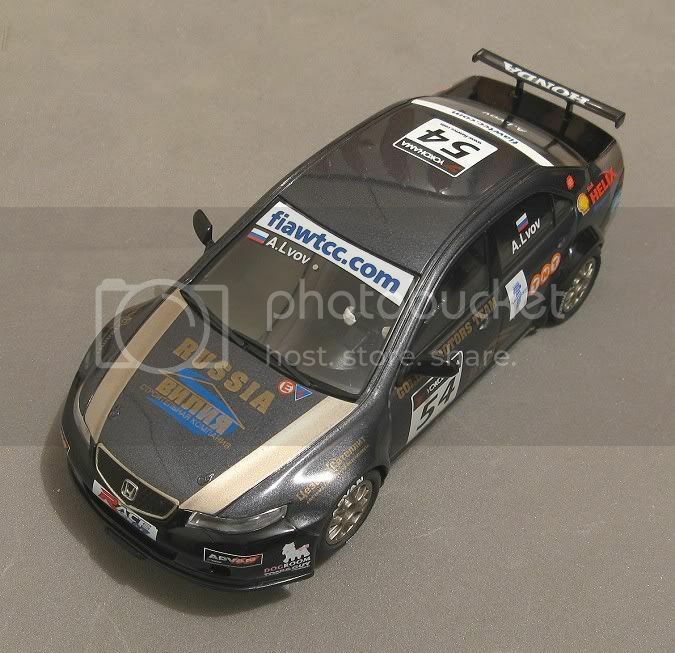 So what possesses an ardent RTR slotcar racer to buy a model like this? Hmmm? Well I wish I actually new, but see this. I go into our local slotcar store, inevitably for spares of some sort for the latest scratchbuild on the bench, and I get side tracked by the models on display, (as you do!) Being a collector in denial, I can look at stuff and usually, If I see something that’s going to look good on the shelf, and make me smile as I walk past it, I eventually track one down on eBay or the internet. Part of the process is the thrill of the chase. The model you want at the best price and the best freight costs. It’s not hard because for the last ten years or so we (and all other collectors) have been spoilt for choice. The phenomenon, which I call ‘slotbonce’ is almost a paranormal experience. You are looking at endless rows of same ol’ same ol’ and there in front, at the back, top, bottom shelf or tucked in behind, you see something, it catches your eye and the ‘I want process starts. Just a trickle at first. But subsequent visits see you looking out for it and saying, ah, still there. Next time, I’ll get it. 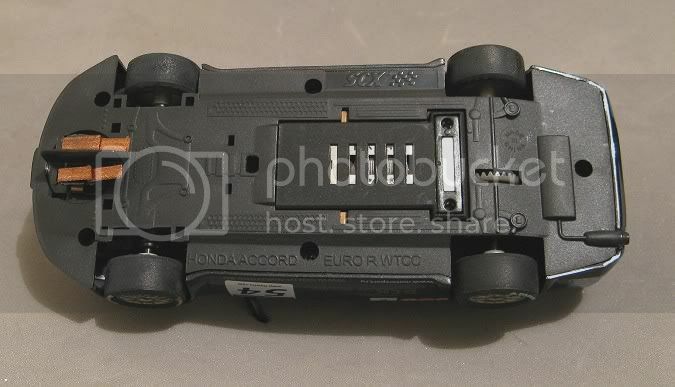 The thing is though that it isn’t a Slot.it Mazda, or a Fly F40 or an NSR this or Ninco that, but a humble slotcar which has grabbed your attention. With me, I look at it and think Mmmm ! nice livery, and look at the shape and what a great axle width and ‘I could do stuff with that etc, etc, etc. And then the challenge is out. Somewhere in the back of the brain, the subconscious has collated all the information about all the previous models you have tuned and raced successfully and in one glance it has applied this mass of information to this model and from some Freudian depth it is saying, this is one, hey, are you listening, THIS IS ONE!! One what????? A winner, that’s what!! This model, out of the box, will have all the hang-ups of an also ran but will have the potential of a winner. Models I have bought like this in the past have all been purchased by this inner voice saying ‘this is one’!! And strangely enough, they have all come good! My first SCX Citroen Xsara. Bought on the way to a race meeting, raced, won and immortalised in the collection. An SCX Nascar which took sometime to sort but eventually succeeded. An Aston Martin DBR9. lots of hang-ups, but after a bit of fettling and track testing, a model hard to beat in its class, what else. Mmmm? A Peugeot 307 which won a non magnet series after a supernatural experience. A little Cartrix Z3 which was sometime in filling its promise but eventually it drove hard on plastic! There are a few more for the list but this little Honda is the latest. Not a new model either. The real thing was a race entry in the WTCC series in 2007. A Russian Honda dealer private entry. I can’t find trace of the car ever racing or finishing either?? This model was probably a livery used at the end of an SCX run out for the mouldings, who knows. But it is a very nice graphite finish with some tasteful gold stripes and decals. And best of all, it has, by sedan (saloon car) standards a huge 62.0 mm axle width. I’m not sure if Mr SCX has been using some Ninco tactics here by exaggerating dimensions but along with its 83.5 wheelbase it has a good useful footprint. Body weight is a bit high for a magnet racer and the famous adjustable SCX traction magnet will have its work cut out keeping it on the track, but I’m thinking board tracks here! Anyway, I’ve got it now so its to the drawing board and a gentle massaging of all its vital functions like removing slack, endfloat, freeplay and all to obtain peace, harmony and a state of nirvana for the model!! As a model it is very attractive. The Honda is an attractive car anyway. Once again it is an example of what SCX can do if they follow the manual. There’s not much bling on the model and where others have opted for photo etched grilles etc, SCX have stuck with a crisp moulding and some well applied tampo. A lack of telemetry antenna was a worry in one sense but a blessing in disguise really! No more little black spots on the roof where aerials once lived! I get the feeling the wheels and tyres could have been better but no doubt as an economy measure they come with some nice wheels but standard SCX size and type seven slicks all round. But they are round and strong. The rim support webbing goes through the depth of the wheel ensuring it will need more than a casual knock to put these rims out of shape! Once again, with directional LED’s as lights the model lives up to one of SCX’s strong points and that is a good light show! And as the model appears to be made from a dark grey plastic, there is no light bleed through the front and rear bodywork ….Hallelujah ! Inside is VERY basic and dark. Even less than normal from an SCX model. Pity, I do like a nice interior and I have been known to look transfixed for more than several minutes at a nice interior. But not this time. A steering wheel, a half driver and a roll cage is all we are going to see when peering into the murky interior of this model! The chassis is as we have come to expect from SCX. 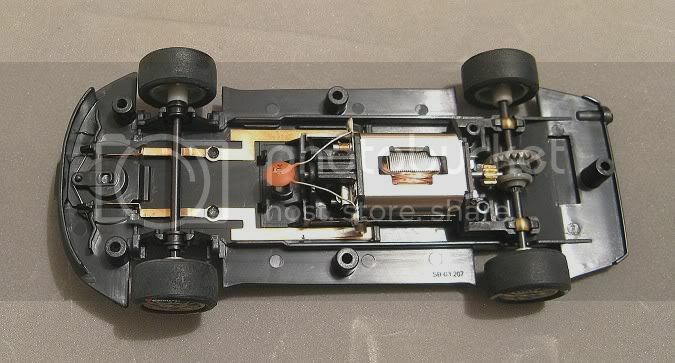 The motor pod is supported on four pins and light and motor power is by means of some long brass spring strips contacting a couple of live rails when the parts are assembled. The front axle has a degree of side slop which will need shimming and the guide is a step back in time. STILL heaps of sideplay and STILL heaps of endfloat in the spring return mechanism. This being 2009, it would have been a nice surprise to find that SCX had mastered the spring return guide mechanism?? The last item of any importance is the motor pod. It has been in use for a couple of years now and I don’t find too many problems with it. The main one though is that with some models, the rear tyres scrape the arches in corners during hard cornering. This is manifested in a marked slowing of the model and the best solution I have found is to minimise the pod movement. This can be easily achieved by allowing a spot of superglue to set on top of each axle travel limiter mouldings inside the body at the rear axle position. Simply put a good spot on top of each one and wait for it to dry. If they still rub, add another spot ‘til such time as they stop rubbing. Having said this, I have had occasion to glue the odd pod in. This has become necessary after the wheels continue to foul the arches after repeated applications of glue spots! So what do we need to do to this model to fulfil its destiny? Mmmmmm? We could just bung a Slot.it chassis in with a 1.5 million rpm motor, alloy wheels (no inserts) wheels hanging outside the arches by 50.0 mm, front wheels 5 mm above the track, Gutted interior substituted for Lexan vac forming!! And rip the lights out, Sorry guys, but that’s what you see a lot of slotcar hermits on a lot of slotcar sites do. Then a $45.00 model becomes a $245.00 model and all for the pleasure of running it at home alone???? I’m talking head to head competition with tangible results! The guide is the first problem. SCX still insist on using their patent tilting guide system. Hard to change because the three piece self centring guide does not lend itself to being casually ‘swapped’! I have in the past removed the bulk of the guide mount and epoxied a piece of PCB with a traditional guide tube mount in its place. This allows some of the deeper board track guides available to be utilised. Another solution is to shim out the guide holder to remove the tilting slack between it and the body. The final movement is removed by coating the bearer surface with superglue and sanding flat once it has hardened. The whole lot then goes back together with no more slack than a conventional model. I haven’t had problems with the guide contacts to date and these will remain. It is essential though, to ensure the braids are as flat as possible on the top side of the guide. This can be achieved by applying a spot of superglue on the tip of a modelling knife between the braid top loop and the guide. Once there, squeeze the braid / guide with a small pair of pliers. This will make sure the braid doesn’t shift somewhere down the road. Don’t apply too much glue though as the braids may need to be changed at some time!!! Working our way back, the front axle needs as much attention. The axle bearings are not only sloppy in their mounts, but the axle is sloppy in the bearings too!. My solution here would be to glue the bearings in the chassis to start with, using a blank axle as an aligning tool. Then, remove the axle and coat the insides of the axle bushes with superglue. Once set it can be honed back to give the axle a snug fit. Another option is to convert the front end to a ‘Wixle’ configuration. This will give the front wheels independent rotation like Fly models and some other makes. This will help greatly. The front tyres will also be changed for some older hard ribbed tyres. This too will contribute to the models smooth cornering. The motor pod is fine but testing will be needed to ensure the rear tyres aren’t touching the wheel arches. If they are, the earlier mentioned fix will need to be implemented. 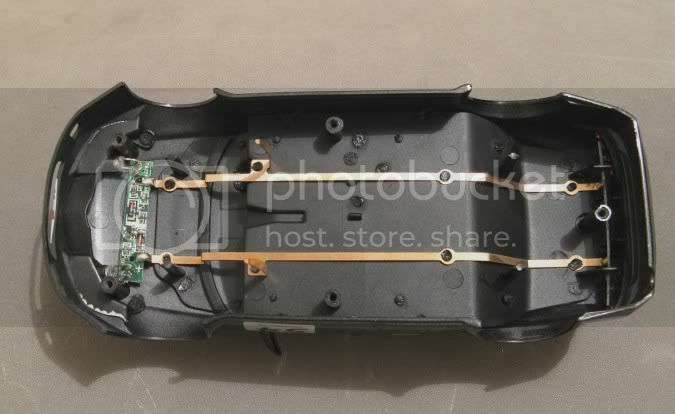 This motor pod has four mounting pins and the chassis is allowed to ‘float’ independently of the body a little. This has the effect of decoupling the body weight from the chassis, letting the chassis spend more time in contact with the track on uneven track surfaces. It is of great benefit when racing older SCX and Scalextric type track and some ageing Ninco tracks. The corners can be very irregular and the straights can have prominent joins and a decoupled body / chassis comes into its own on these surfaces. The flatter the track, then the less benefits, but I always have a degree of movement in my models no matter how smooth the surface I’m running on. At the back of the model and still part of the pod is the rear axle and bearings. The later style round bearings on SCX models allows the bearings to ‘self centre’ in comparison to the axle. With some of the cylindrical type bushes popular for many years, there is a risk that the bushes can be held out of line by a distorted chassis, causing drag on the final drive. Carreras had this problem on their early models when they mounted a bearing retainer over the axle bushes. Slackening the retainer screws was rewarded by an increase in motor revs as the axle bushes moved back into alignment! Rear tyres are SCX type sevens and should be fine for board track once they are sanded and cleaned. There are better tyres about but with a bit attention these should suffice for most racing. On a coarse surface magnet track I might opt for a soft ribbed tyre on the back, something like a Ninco soft ribbed tyre. On a smooth plastic track like Scaley sport or Carrera I would tend to use a natural rubber tyre, either the originals treated with WD40 or similar and dried or P4’s or Ninco slicks prepared the same way, and on a dead smooth track I might be inclined to use a new urethane tyre of some sort. Which brings us to the motor. In the racing I do locally, the motor is the benchmark for each class. Most of our classes limit the use of motors and 18,000 rpm @ 12 v is our motor class ‘B’ benchmark. SCX rate almost all their motors at 14.0 v and a motor rated at 19,000 rpm at 14.0 volts will be running at about 16,500 rpm at 12.0 volts. In theory, motor speed is almost linear with voltage plus any mechanical losses. The RX 42 in this model is a bit short of that range so it will require a degree of blue printing to bring it closer to its competitors. There will be no component change. Just some fine tuning of the brush timing and if the motor vibrates excessively, the armature pole pieces will be polished. The motor will not even be opened. This should bring it up close to Pro Turbo rpm. Rear wheel diameter				19.70 m.m. Progress					20.63 m.m. per motor rev. Rear tyre tread width				8.0 m.m. Guide thickness (median)			1.36 m.m. So here is another task I have set before me…..as if there aren’t enough already! Mmmmmmmm! No matter, I am confident the model will rise to the occasion and will soon be beating Scaleys, Fly and Ninco on our tight and technical circuits!! Stay tuned.